Remembering Shakespeare tells the story of how a playwright and poet in late sixteenth- and early seventeenth-century England came to be remembered as the world’s most venerated author. Curated by David Scott Kastan, George M. Bodman Professor of English at Yale, and Kathryn James, Beinecke Library Curator, the exhibition brings together works from the holdings of Yale University’s Elizabethan Club, Irving S. Gilmore Music Library, Lewis Walpole Library, Yale Center for British Art, and Beinecke Library, in an unprecedented display of one of North America’s finest collections on Shakespeare. Drawing on these extraordinary resources, Remembering Shakespeare offers a unique visual history of how the “Booke” of Shakespeare was made and read, written and remembered, from his lifetime through the present. 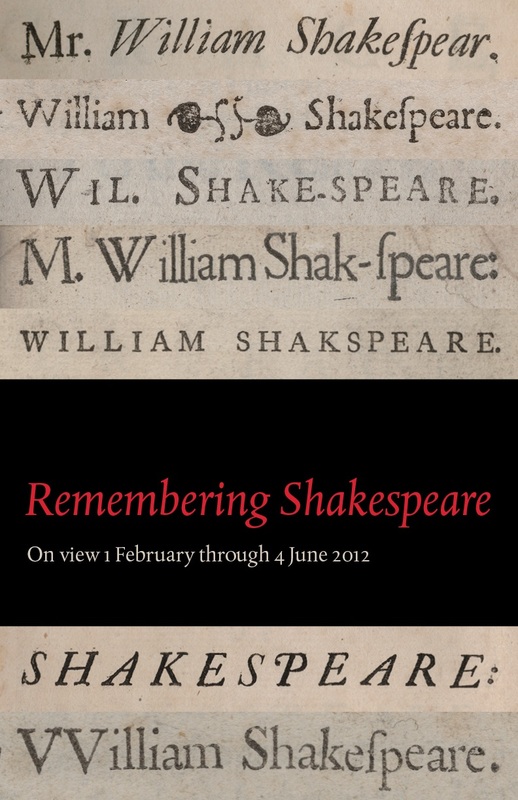 Remembering Shakespeare can be visited at Yale University’s Beinecke Rare Book and Manuscript Library from February 1 – June 4, 2012. The exhibition is accompanied by a catalog, Remembering Shakespeare, by David Scott Kastan and Kathryn James, published by the Beinecke Library in association with Yale University Press, 80 p, 72 color illu, $25 / GBP 18.04. For review copies please contact Robert Pranzatelli (North America); robert.pranzatelli@yale.edu. Thank you Beinecke Library for a great exhibition. Vuyo Gontshi, South Africa. Thank you for this amazing website. I am only disappointed that I will be arriving in your area two days too late to view this exhibition, but this site almost makes up for that.